About a year ago I did a review of the Drive Gate DG-1. Since then TopTone has gained a lot of recognition for their pedals and a couple of newcomers have been added to their rooster. I recently got my hands on the DG-2 and the Light Drive. Here’s my review. The Light Drive and DG2 are both housed in MXR-sized aluminium boxes and feature true bypass switching and runs on 9V battery or Boss-style adapter power feed. 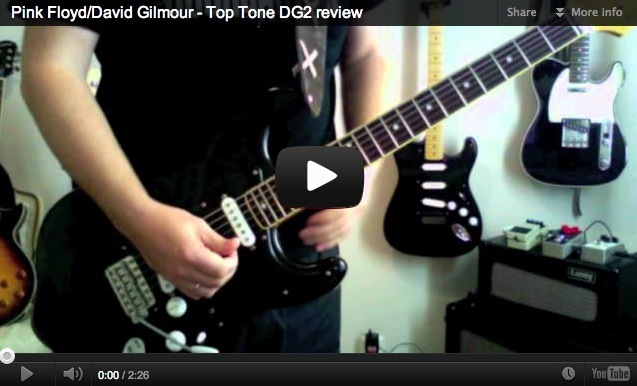 See my review of the TopTone DG1 here. The Light Drive has a strong tonal resemblance to the Cornish SS2 with a warm, smooth character typical of many of Gilmour’s milder tones on PULSE. It really has a wide range of tones from punchy transparent clean boost to creamy overdrive/distortion. A mix between the Keeley/Analogman modded Boss BD2 and a classic TS9 comes to mind. It’s an incredibly versatile pedal that brings life to your tones, adds a nice crisp attack and lots of sustain. I prefer it as a clean booster set just on the edge of breaking up but it could easily double for the Tube Driver and those hard edge overdrive tones. I’ve always had a hard time finding overdrives that manages to stand out of the overwhelming variety of pedals. Every model seem to offer something different but only a few catches my interest. The Light Drive works very well for most genres and styles, whether it’s bluesy single coils or hard rock humbuckers. It also manages to stay nicely focused and maintains most of its character on typical bedroom volume levels. 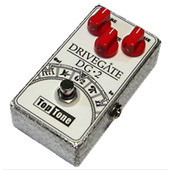 The DG2 is very similar to one of Cornish’s more unique pedals – the G2. According to Cornish the G2 is based on a generic Big Muff design but the combination of silicon transistors and germanium diodes places the effect closer to a germanium fuzz with a much warmer, smoother character than the usual Muff. Personally I think it’s very close to a classic RAT (LM308 models) which isn’t that surprising really since the RAT was actually based on the old germanium Fuzz Face pedals that were modified for more gain. Compared to the average Big Muff, the DG2 has less lower end but considerably more mid range and sustain. For this review, I did an A/B test the TopTone DG2 and the Cornish G2 and there’s no doubt that the DG2 sounds better to my ears. In all fairness, they’re very similar and at some settings, they’re hard to tell apart. The G2 has buffers, which obviously makes a difference with long cables and huge pedal boards. The pedal buffers the overall signal, which also better maintains the character of the pedal. I don’t mind true bypass but it can end up sounds a bit too dark on some setups, which might result in the DG2 sounding not as open as the G2. The DG2 has a bit of noise, which is typical of the mid boosted pedals such as the RAT. It’s nowhere near a RAT in the level of noise though. It also got a much more open tone than the RAT. More presence and a bit more bite in the top, which is a pluss if you think the RAT and similar can be a tad too dark. Compared to the G2, the DG2 has quite a lot more gain, which is why I like this pedal more. Comparing the two I think the DG2 has more of an edge, a more open tone and that little extra, which the G2 doesn’t have. Call it mojo or whatever. I recommend this one warmly! I know some have argued that TopTone is basically making Cornish clones. Call it what you will but I don’t see how that’s any different than making a clone of any pedal. What matters to me at least is that a pedal offer a tone that I can use and one that makes my playing sound better. In this case, I also prefer the TopTones over Cornish. You may disagree but that OK. That being said, I think it would benefit the TopTone brand to reconsider the name of some of their pedals. It’s tempting to use obvious references but I think it only devalues the otherwise brilliant pedals. I don’t usually comment on prices but $300+ for a single stomp box is slightly above the average price range. However if you’re like me – not willing to have a huge grey box on your board that you have to wait over a year to receive – then TopTone is a welcomed addition to the wonderful world of stompboxes! Iâ€™m sorry that this is late to this review, but I may pick up a DG 2 to replace an old RAT Big Box Reissue. I love the RAT as a dedicated distortion pedal, but it is very noisy and doesnâ€™t play well with others as the noise increases exponentially with gain. Acknowledging subjectivity, would the DG2 be a good replacement for a distortion pedal, especially the RAT? The RAT certainly has a cool thing going, just that noise! Yours and Kit Raeâ€™s review would lead one to think that the DG2 is what the RAT aspires to be, and a very versatile pedal at that. The DG2 is based on the Cornish G2, which is kind of a mix between a Muff and Rat. It’s got the fuzz harmonics but also the compression and mids of the Rat. It’s somewhat overlapping in both worlds and very unique. I think the DG2 is an excellent version of the original. Outstanding! I bit tge bullet and found one at a very reasonable price. It should be here tomorrow. I canâ€™t wait to see how it compares to the Rat. Maybe it will take itâ€™s place or maybe it will justify a bigger Board! Between Buffalo FX Evo and Top Tone DG2, which one would you pick? Already have a Patriot, and I want to cover the fuzzy od that Gilmour uses on A great day for freedom, Echoes or Coming back to life (Live in GdaÅ„sk). I’m a Rat user, but I think the Rat won’t give me those sounds. So, I’m choosing between Evo, DG2 and Dover Drive. Both the DG2 and Evo are great. The Dover is a slightly different sounding pedal. The Evo is slightly darker and smoother so that’s perhaps my favourite of the two. I’ll stick to your opinion. I’m not only aiming for Gilmour’s sound so I’ll give Evo a shot. Thank you, Bjorn, you are the best. Hello Bjorn! Thanks for all of the great reviews. I’ve been thinking about replacing my Blues Driver with a Light Drive, but I wanted to make sure it could be used to boost a Muff before I did so. Thank you. Sorry for my very late reply, Nicholas. 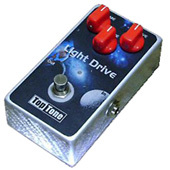 The Light Drive is similar to the Tube Screamer, with emphasis on mid range and compression and moderate low end. Not ideal as a booster in my opinion. The Blues Driver, or a Powerbooster clone, is better. Does anyone have any suggestions for an alternative to the DG2? I like it but want a bit more control over the low end as it is too wooly/woofy on the low strings when on the neck pickup. I’m not that experienced with active pickups, other than the DG20s, but among passive pickups, the SSL5 and P90s are very close but more responding to your playing and easier to tame. Thanks Bjorn. Seems I wasn’t clear in my original post. I have SSL 2s (SSL 1 but with flat pole pieces) and a SSL 6 (SSL5 with flat poles) in my guitar. I’m not looking for a less wooly pick up. I’m looking for a less wooly pedal than the TopTone DG2. The TopTone DG2 sounds great through the bridge pickup but too much low end on the neck. Otherwise I like its tone. Sorry Andrew, I don’t know why I mentioned the DG20… I didn’t read your question properly. The DG2 is a distortion and saturated distortion will often sound boomy on the neck pickup. It’s just the nature of the pedal. The G2 doesn’t have all that low end either so you might want to consider the bass on your amp. If you really need to use the neck pickup you might want to look into a similar sounding overdrive, like the Vick Audio Tree of Life or the Fulltone OCD. Hello Bjorn! Question for you: Is there a place on the board for both a Dover Drive and a DG2? I currently use a Wampler Pinnacle (boosted Marshall in a box) and would prefer to avoid redundancy. I’ll be running these through a Fender Supersonic on the clean channel (basically a Deluxe Reverb). Thanks in advance. Very sorry for my late reply, Mick. Depends on how picky you are :) The Dover sounds like a Tube Driver with the bass and treble all the way down and it has a lot of gain. The DG2 cover much of the same ground but it has a more open charter and a bit more gain for that distortion flavour. I would perhaps go for a TDX/PlexiDrive and DG2 combo for more versatility. I love your site! You’re doing a great job! I was thinking about getting a TopTone DG1 or DG2 as my main muff. I already own a TS808 and an Fulltone OCD V3. Would I really get new sound texture with a TopTone, and which one would be the best one? Thank’s for your valuable advice!!! I would like to know how this drive goes whit power cords for rhythm. [Hi Shaun! Terribly sorry for the late reply. Thanks for the update! You don’t need to cover both the cavity and back of the pick guard with copper or aluminum. I’ve tried different things but it always seems to work best covering the whole of the cavity with copper. Remember to connect those wires for ground as well or it won’t have any effect. It’s not a shield but rather a drainage so you need to both connect to ground and make sure that there aren’t any contact between the copper and any hardware – it will short circuit if there is. How suitable would you say the DG-2 is for Dave’s early Atom Heart Mother germanium fuzz tones? I have a Green Russian Muff and a BC-109 fuzz face and the only thing I need now is something that can cover those tones. But I feel like I want something more versatile than another fuzz face and I don’t need another muff. Isn’t the G2 what he used for Fat Old Sun on the On An Island tour? Bjorn, what do you consider the best for Pulse and Delicate tones: DG-2 or Wren and Cuff Box of War? Thanks. I live in Brazil. Have a DG-1 bought directly from Olmar. He’s a very nice man, very respectful and treats everybody very well. Here in Brazil, it cost me about USD230, including very fast shipping. Now I’m severely considering to have a DG-2 too. But I don’t know… I really like the Delicate and Pulse tones, so I’m divided between DG-2 and Wren and Cuff Box of War. What do you say, Bjorn? In the video are you using a boost for the DG-2? And I was wondering in your opinion what would be the best distortion pedal without a booster for Gilmour tones? Thank You! Hi, I had a question about where in the chain should the Top Tone DG-2 or Cornish G-2 typically go, when you a combining with a tube driver. I typically go guitar-compressor, but then I get confused with whether to use the distortion (DG-2/G-2) next or the overdrive (tube driver) in the chain, then modulation, chorus, delay, etc. I know you can mix up your chain in many combinations, but I’m looking for what you think is the better chain setup when getting into David Gilmour’s later “Royal Albert Hall” & “Gdnask” sounds. Really enjoy your site and your feedback. Thanks. Bjorn: As always fantastic review (both here and on The Gear Page). I bought a DG-2 based on your recommendation and am very happy about it. One disappointment I had though was stacking a Muff (I have a SUF Violet Ram’s Head and a Wren and Cuff Box of War) with the DG-2. Especially when the DG-2 has the sustain low at 9 oclock, the results were horrible – raspy and all the low end content was gone. I wondered if you have had any luck stacking a Muff with the DG-2 and what your settings were, or, what to look out for in getting something really focused. Thanks! Thanks, Bjorn. Figured you took some extra measures (looper) when doing the comparison to make sure it was as similar as possible, but I think a lot of demos on youtube aren’t exactly apples to apples. Both the G2 and DG2 sound great, think it will just end up coming down to money. I’ll probably use the money saved on the DG2 and get a backup amp. If you get the chance, try out a VFE Enterprise. Its a great mxr phase 90/45 clone with the bonus of a vibe mode. The vibe is so so, but its workable. Great review of the DG-2, Bjorn. Based on your review along with Kit’s review I purchased the DG-2 for my germanium fuzz tone. It was worth the money! The DG-2 replaces the Germanium 4 Muff I have been using. I liked the Germanium 4 Muff but for some reason the pedal was way too LOUD! I had to set the level on about 1.5 out of 10 for a level slightly greater than unity. I felt that was choking the pedal. You handled the Cornish storm well. I did not see you as insulting to Pete Cornish. Your honesty in your product reviews is refreshing! I always enjoy your reviews and use your advice – great addictive stuff ! How would you now compare the TopTone DG-1 vs DG-2 ? Bjorn, this is kind of an older post I know but after reading what people are saying about “pete cornish” and how you are “insulting him” I had to say something back. Bjorn is NOT downing the man…at all. He never once insulted him, all he said was that its a better deal to go ahead and buy a VERY good clone from toptone instead of wating a long time to recieve a G-2, the toptone is smaller, for more room on the board, and its about $300 cheaper!! My lord people he is trying to help you! Just saying. Remember Bjorn no matter what you do in life, there is always someone who has to not agree about it and show their opinion… Dont let it bother you, you have the greatest site on the internet IMO. btw I went with the DG-1 and couldnt be happier! (: thanks to your review! thanks for your site! and God bless! Thanks lots for the help Bjorn! I think I’ve finally made up my mind & will go on to buy an RB pedal. I believe cause its so versatile it’ll suit my rig perfectly. Am still also thinking about getting the Rabbit, but will see on that. At the moment I have a Vox AD120 valvetronix stereo amp (with dual preamp tubes), which i guess makes it a hybrid kind of amp. Its not bad, had it for some years now & can get some decent sounds out of it, but for the future I’m definitely thinking to get a nice REAL tube amp. I got a couple in mind, including the Reeves custom 50 that you’ve recommended. I run an original TS9 for rhythm stuff & a Catalinbread Hot chilli volume boost pedal along with an Eq pedal in the fx loop. Got a Voodoo lab Sparkle drive too that I use. I’m sure that a nice fuzz pedal will liven things up there :). My main guitar is a custom Start copy that I’ve had modified over the years, custom birds eye maple neck with ebony fretboard, 22 frets. I have a Duncan ssl 5 in the bridge, plus Fender lace sensor gold in the neck, silver in mid position. Also have a Gibson Nighthawk as my second guitar. Ps. Just been watching a Skreddy Pink flesh pedal on ebay recently & the other day it went for $ 640 !!! No wonder I could never own one now hehe… Though when it comes to collecting guitar gear I’d reckon never say never,….I’m sure you’d agree ;). Mate thanks again for your guidance, i now have a much clearer picture in my mind about what options i have out there. I was fortunate enough to go & try out the Musket pedal the other day when i went to a local shop here that stocks a LOT of boutique style pedals. A nice pedal no doubt, can be used as a Muff “modeller” & got some decent tones out of it. I also had the chance to try out this really awesome pedal by Freakshow Effects called the Rabbit. Not sure if you know of it, but essentially it is a Rat clone but with so much more! Besides having identically same configurations & components, it also has a 3 way mini toggle swith that engages diode clipping stages which really brings the pedal to life & turns the common Rat pedal into one dynamic beast. I definitely recommend checking it out ! I’d say that cause of the DG2, which is close to the Rat as you’ve said, it would be fairly easy to achieve that kind of tone with it, amongst some other cool ones. Goes for good price too. Btw, i’ve read your review of the Royal Beaver & am strongly considering giving that a go also. Too bad that i cant find anyone that stocks it here though :( . But i must say that on the clip you’ve made it really sounds amazing! Seems like such a versatile,flexible pedal! Looked at some others on the net & found them sounding great too. Lastly, that little Laney head you have sounds awesome! What a fine little amp. How’s the clean headroom with the El 84’s? Do you still have the original tubes in it? I couldn’t see on the website if it had channel switching or not. Have you ever had the chance to check out the Blackstar HD5 mini amp head – that little beast sounds great too. Though not as powerful as the Laney, being that it has 5w output, it sounds pretty loud, at least for home use. Am strongly leaning towards getting the Royal Beaver, though i really dug the Rabbit & the DG2 is still on my conscience ;). Either way, they’re all great sounding pedals so in the end im sure i wouldn’t regret getting either of ’em. Looking forward to more of your cool reviews & your advice is always a great help in my quest for that awesome tone : )! Thanks lots for the feedback, i really do appreciate it! Since i cannot guarantee that i’ll be able to hunt down a Pink Flesh pedal any time soon in the future, (btw, i’ve heard stories that they’re supposed to go up to triple their value & more when they turn up on ebay ) so its a distinct possibility that i won’t be getting one perhaps. However, as i’ve mentioned earlier, the Top tone DG-1 / DG-2 are right up my alley too tonewise & am strongly considering getting one of these instead… Am starting to feel they’re sounding better to me now than the Pink Flesh after listening to clips more closely. So in light of that, i just wanted to ask you what your thoughts are on them as far as preference goes….. I do recall you mentioning a little while back when you did the DG1 review based on the performance from one of your shows & said that you’d be happy to employ it in the future on your pedalboard. I’ve heard some sound clips & it really does sound awesome, but so does the DG2 on your Money demo… Its just that i can’t quite settle the differences between the two & not sure exactly how they’d differ in a sonic sense. Am probably asking for too much, but it would be great to get a pedal that’s versatile enough for a wide range of Gilmour tunes. You’ve also mentioned that the DG2 is now one of your 2 main lead pedals alongside the RB. I’d take it that you were going after “YOUR” preferred sound too when you gave the thumbs up for the DG1 at your gig. In the end, what then made you settle more on the DG2? Like i mentioned, i do love a versatile pedal, which is why i’ll check out the Musket also as you’ve recommended it. Thanks for the help again Bjorn, you’re the man :) Keep up the great work! Its basically concerning the Skreddy Pink Flesh pedal… After doing some personal research Im assuming its true that its not made anymore :(… I kind of became a bit ticked off & frustrated cause of this cause after reading your excellent review plus other peoples positive feedback & of course comparing it with other pedals, including the Toptone dg1 & 2 among others, my heart was happy & was really looking forward to getting one of these babies! Tried looking for it elsewhere but with no success… Truthfully, I really felt in my bones that this was gonna be The PERFECT pedal for me especially when you yourself mentioned that its a kind of pedal that sounds quite as good on both a small & larger rig! Do you feel that with what’s out there,would anything compare same or at least similarly? Thanks so much for your help in advance, any help would be greatly appreciated! Bjorn, Kit (anyone else) does anybody have any thoughts on the Mad Professor Fire Red? To all the detractors….lighten up. Cornish never did you any favors by charging such big money for his pedals and taking down the Gilmour board pics after some people started making their own similar looking ones. It was long overdue that someone would reverse engineer his stuff. As was already mentioned, he started with someone elses design too. Share the wealth if it’s not YOUR design. Hey Bjorn, I just bought two new pedals recently you might be interested in hearing about. One is a Whirlwind Rochester Series “Orange Box”. This company was started by a c0founder of MXR, more specifically, the guy who designed the original Phase 90, DynaComp, and Distortion+ pedals. This pedal is basically a ’74 Reissue MXR Phase 90, but with true-bybass, LED light, and 9-volt AC jack (actually made with quality parts too). It sounds just like an original Phase 90, and doesn’t rely on batteries. The second is the new Electro-Harmonix Germanium 4 Big Muff Pi. This thing is really sweet. If you haven’t yet, you should check one out. Basically, a germanium OD and distortion in a combo pedal. Pretty sweet. With this and my MXR M-173 Classic 108 Fuzz, I get Gilmour tones all day long. Oh, can’t forget my Space Echo either! Haha. I seriously recommend scoping both of these out, if you haven’t already. Keep up the great work! Hi Bjorn ! I’ve one question for you : did you really buy this pedal 310 $ US ? because I saw the toptone website, and i know the price including shipping but, maybe its way to expensive ! cheers !! So if I want a DG-2, am I oblige to command it from Brazil or some american (or canadian) sites sell it ?? thank you very much for the answer(s) !!
? So, whatÂ´s the difference between DG-1 and DG-2? If you can cover every distorted Gilmour solo with the DG-2 – what the DG-1 is for? Could we say that the DG-2 the Toptone take on the ProCo RAT, while the DG-1 is a better Big Muff clone (as the Cornish P2 is)? That would supposedly mean that the the DG-2 works better at home level than the DG-1. A practicing pedal deluxe, so to say. BTW: Cornish pedals and floorboards are pure crap, IÂ´ve tried all of them! Sound nothing like Gilmour. It makes no difference to me, I can afford neither PC or Top Tone. But I admire the beauty of PC custom boards, and I know all his stuff is brilliantly made. I know it sounds mad, but I have always thought the individual pedals sound like the box they are in. (yes I will buy cotton buds tomorrow). There is a boxiness in there amongst the tone. (particularily to be heard on vids on You Tube) Anyway what I really wanted to say was. The bulk of Pink Floyds’ best material was produced without any of these esotric items, so if you buy them you are trying to recreate the sound of somebody trying to recreate the sound even if that somebody is David Gilmour. I am glad however that you have the intergrity to say if you like a product or not, since you are not having to rely on advertising revenue for this or that huge conglomerate company. I have been around this website and elsewhere long enough to feel that if you say that a product has made its way onto your board or into use by you, it is not just because you got one free in the post. Keep up the good work, I know it will get harder as AirBag gets the bigger and wider audience that it is bound to do. didnÂ´t recognize at first that this is a “DG-2” (and “Light Drive”) review – and not “DG-1”. I have a RAT 2 with that LM308 mod. (The LM308 chip costs about 0,60 Euros – and is definetely worth every cent. ;-) ) Good pedal, as I remember. Which Gilmour solos are typical “G-2 solos”? Second solo from “Money”, okay, but what else? Come now guys and girls lets not loose our way with this review and definantly not loose sight of what this site is all about.This is an informed view of what our Gilmourish site owner thinks of a pedal that he deems worthy of a mention in that it is a nice pedal wich is quite capable of helping us achieve a gilmourish tone.Thats mostly the reason why we are all here isn,t it.He is not slating Cornish pedals or saying they are not capable,as we all no they are and thats even if we havent been able to try one.Mr Riis or Bjorn God bless him is just bringing to our attention different pedals that in his own opinion could help us to achieve this goal.And remember they are his opinions not the suppliers.Im sure most of us realise this but im very sure all of us have been thankfull more ways than others in one way or another for this site.I for one hope Bjorn continues to find these golden nuggets and continues to give us his views.Its up to us anyway in the long run if we want to pursue any of his views further. Quite right Pete, god knows if i had the money I would have the whole lot! The fact is: concerning TONE, there are many other pedals capable to give you a gilmouresque sound as good as the ones provided by Cornish stuff. TopTone seems to be one of these alternatives. Tone is indeed a personal taste most of the times. People should not forget that Gilmour played with Boss pedals and he was still Gilmour. These Brazilian pedals are a serious job at it seems. I personally do not think that you said anything against Cornish pedals. Everybody knows that you said before that those pedals are amazing. And you said thet the reason you like DG2 more that Cornish G2 is that is has more gain. And you pinpointed that DG2 is more noisy. Given your set up and ears you like DG2. Good choice!! Each one has ears and personal taste and is better to use them more than just go buy gear based on reviews or based on artists. Bjorn, now you know why I wanted you to go first! The wrath of the Cornish horde! I’ll throw my two cents in about Cornish pedals, and side with Bjorn. I like his stuff, but I like anyone who makes good spins on Big Muffs because I am a Muff fanatic. I owned a P-2, and currently own a G-2, which filled the hole my Rat left when I booted it off the board. I also recently got the TopTone DG-2 to try out. I liked it better than my G-2, and the DG-2 has now replaced it on my board. The G-2 is a great pedal for that Rat-ish tone, and I really liked the buffer, but I simply prefer the sound of the DG-2. It’s as simple as that. The fact that I paid a ridiculous amount of money for the G-2 does not change what me ears prefer. They both sound great, but the DG-2 just had that extra something I liked, and it’s also a very well built pedal. My first Cornish was a P-2. Good Big Muff clone, but overall it was nothing special. I had several Big Muffs and Muff clones that sounded better and were much more dynamic. It just did not cut it against the sound of my Civil War Sovtek, and my BYOC Large Beaver Ram’s Head pedal (purchased based on Bjorn’s review here) with the mids switch on position 1, sounds identical to the P-2. I was fortunate to try out a P-1 this year. It was one of the finest sounding Ram’s Head Big Muff clones I have ever played. I own a vintage Ram’s Head that sounds slightly better, and a violet RH that sounds practically identical, only with less gain at max that the P-1. Pete has added his preamp buffer circuit, but make no mistake, the Big Muff circuit in this is an exact clone of a vintage Big Muff circuit. Not much originality there, but the add ons I mentioned, the nostalgia of owning a clone of a DG pedal made by Pete, and Big Muff my addiction, were enough to make me put one on order. â€“Originality – All three of these pedals are based on Big Muffs circuits. In fact the exact same pcb board is used for all three, and clearly follows Bob Myer’s original circuit path, which itself was also based on a common amplifier circuit. There are some very interesting and original twists in Pete’s G-2 components and values however. Not so in the P-1. The P-2 has a few cap and resistor value changes that make the mids stand out more than a typical Muff, but nothing you can’t get on a BYOC L Beaver. -They have very good preamp buffers and are relatively quiet for Big Muffs. Though I take issue with anyone saying they are the quietest. I have other Big Muffs clones with no buffers that are quieter. -The components used on the pcb are common, no different than the components used on the majority of other boutique pedals out there (yes, I degooped mine). -Soldering and wiring are top notch, as are many other boutique pedals I own from other makers. -The gray boxes he uses are huge – unneccesarily so. Board real estate matters to me. Pete could economize his pcb and internal space much better like most of the other markers do. Perhaps space does not matter to him, though I have noticed he is now offering smaller enclosures as an option. Structurally the enclosures are no more sound than most other modern cast aluminum enclosures. Probably less so because of the wider face, but it is very hard to crush ANY modern enclosure. -Yes, you can wait up to a year or more for Pete to make some of these pedals as Bjorn said, especially the P-1. The wait on some of his other pedals is not so bad. -They are insanely expensive compared to other makers, but it’s Pete’s prerogative to charge whatever he wants. In summary – Pete is not God, he is just one of the better pedal makers out there, though over priced IMO. Pete did not invent the Big Muff, but added his preferred preamp buffer improvements. Pete makes good sounding pedals, built to last. You may absolutely love them. You may also find pedals that sound better, are just as reliable, and take up less space, for far less. It may be that you called cornish a big grey box, with they are, or the fact that you said you have to wait a year to get one, witch is not true. And I dont regret that one second, cause now I can read all your reviews without wanting to buy new pedals. In the long run It will save me a lot of money. Im sure Top Tone makes awesome pedals, but I guess I will never know! :) Conish pedals are PF and Gilmour history to me. But what I wonder is if David did these 3 solos “intentionnaly” (I mean he get the idea of 3 different tones, before record) or, maybe did he played 3 different takes for ALL the solo (I mean all 3 12bar-cyles) with 3 diffrent setup (strat with fuzz and echo, strat with fuzz “dry”, and bill lewis guitar), and then MAYBE was it only during mixing that he decided to keep the 3 different tones, just by hearing it by using his technique to swap between different takes, as he do very often. Speaking for myself I prefer buying pedals that actually works when I get them, and that will continue to work for a lifetime without a single problem. And I certainly prefer a signal that is preserved in the best possible way from guitar to amp, with a minimal amount of noise. My local store has all the Cornish-pedals in stock too (not the Custom Designs of course), so that’s not an issue. And I have to say that I find a lot of pleasure owning pedals from the man who takes care of David Gilmours setup.. Did I say that they hold up in value quite well too? :) Have you tried the Custom Chorus and the TES btw? Just curious! But it was a nice review anyway, and I’m sure the DG-2 is a great pedal. Don’t take me wrong! :) And your playing is top notch as always BjÃ¸rn. The Orb Featuring David Gilmour: “Metallic Spheres”. I heard the album and I got my opinion too… I’ll wait for you review! Amps,Guitars,Straps,Strings,cables and a multitude of bits and peices. would still be looking on ebay to buy that “Gilmour Pedal”. Give Bjorn a break guys! haha, the man’s busy! If you don’t mind Bjorn I’d just like to say it’s great that you’re doing reviews of clones. Admittedly yes, I would love to have a pass to the country club, complete with two jaguars, an aston martin and the full range of cornish pedals built into a deluxe board, but cut a poor guy some slack, Â£400 ($650) is a helluva lot of money for a G2/SS3/P2. Pete Cornish makes AMPLE money from his pedal sales, considering his clientelle include Mr Gilmour and Pete Townshend. I’m sure if it was me, I’d enjoy the competition of another builder, and be honoured that there was such a demand for the sound i was making in the “underbelly” of the guitar society :P.
Pete probably owes alot of business (and complaints of manual labour) to Bjorn for the informative research he has given on Gilmour which no one else would have bothered to do. Bjorn, please keep reviewing clones/boutiques/mass prodcued AND rubbish pedals, as you’re drawing in a bigger and bigger audience with each post. Well Mr Bloody Riis what can I say.Great review as always and an even better video :) Remember I bugged the hell out of you, must have been last year or so for a vid clip of money played on a 21 fret neck.Do one Bjorn go on do one,on a 21 fret neck please please do a vid clip blah blah Haha a bit bloody late aint it mate :)As i said,great review great vid keep em coming Bjorn.All the best mate . Maybe I should look at these pedals made here in Brazil. The prices are quite international, though… And I don’t know if it would be a big difference to change my Green Sovtek Muff for a DG-1. On the other hand, the DG-2 would be interesting, considering I don’t have any germanium pedal. Going off topic: have you tried the EHX Deluxe Memory Boy. It seems to have some nice features and costs a lot less than the Memory Man. Thanks for the review. I’m sure those are decent pedals but I’m not sure I like to see you to advertise these pedals even after how much Pete has helped with your Gilmour gear research. There’s one difference cloning green muff and PC pedals. This most probably won’t hurt Pete’s business so I guess it’s more of a principle. Take care. I got few questions regarding that; first I just cant find a 57 neck on internet so I would highly appreciate if you have any sites, or links where I could find some. finally and my last question is, do you recommend changing the nut even if I buy locking tuning machines? I plan on buying locking tuners from schaller or something, so is it really necessary to change the nut to? Nice tones there Bjorn!! we (well, actually I jeje) really want to see your actual pedalboard updated. I’ve never understand all the emotion regarding the G2, I really preferr the Big Muff tones, but this clip shows very well the sound. I think I understand you about the overdrive, my search is infinite I think.. I need a good overdrive who can give me the open tone of Animals and the wall but still capable of that mid-hump that makes my amp go to the stratosphere..
Hey Bjorn, I know your pedalboard has recently gone through a lot of changes with the work on your new Airbag album. Can you do an update to your pedalboard under my gear, maybe one for Airbag and one for the Pink Floyd Experience? I would really like to compare. Keep up the amazing work as usual! – do you have 2 black strat clones ? I thought youhad just one. – about the Money solo(s) (one of David’s best IMHO), do you think that Money has 3 seperate solos (with 3 distinctive sounds) because David “wrote” the 3 ones “intentionnaly” before record (I mean he already had the idea before record), OR was it “accidental”, as David could have recorded 3 takes, trying different sounds, and by using his usualtechnique (switching from solo to another using the mixing desk) he found it good and decided to keep it that way? – last one : is it really impossible to play the higher notes of the last solo with a 21 fret Strat ? (I must admit I’ve never tried) Didn’t David played these notes on his strat (black in 70’s or red in 80’s and 90’s) I ask you because you don’t play these last high notes on your video. [1. Yes. It’s a Fender CIJ ’65 reissue rosewood and a CIJ ’50s with maple. I’m swapping pickups back and forth and some other stuff to see which is better. For the moment I’m more into the ’65. 2. David’s Money solo is widely documented in interviews etc. All three solos are played with a Fuzz Face and Binson echo into a Fender Twin. The first solo was played with the Black Strat and dubbed manually (second take) to make it sound bigger. The second “dry” solo is played with the Black Strat, single track.The third solo is played with a Bill Lewis Custom guitar that had an extra fret for those high notes. The solo was automatically double tracked with a processor to make it sound bigger. 3. I don’t think David’s played those high notes on a Strat and I think you’d be struggling pretty hard to manage it. Id like to see your new pedal board….I bet that the setup is substantially different. And the pedal sounds amazing but then again you make every pedal sound good…. Fracking brillant Bjorn!! Geat job, again as always, and a huge thank you for this review. The DG-2 has been on my list, and I have been playing the waiting game for Kit or yourself to post a review. The price does not disway me too much, but I refuse to pay top dollas for (potential) rubbish. The clip is a huge bonus. I am sure that the Cornish is a tad superior, as I would expect it to be, but knowing there is a (more than) suitble clone is HUGE!! Hopefully, you’ll get your hands on some of the SUF products. Those are unreal as well! what did you meen in the very last paragraph “â€“ not willing to have a huge grey box on your board that you have to wait over a year to receive ” just curious about what you ment right there?